View of the White House from across Kew Gardens. Originally built as a home for Sir Henry Chapel in the 17th century, it was constructed of timber and red bricks, and was later remodelled in bright white stucco by William Kent. It was put out to rent and then bought by Frederick, son of George II and his wife, Princess Augusta. It retained its status as a royal residence after Augusta's death in 1772, being used by George III and Queen Charlotte during the king's long and infamous convalescence. 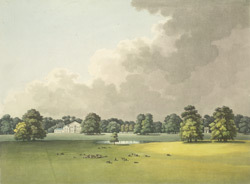 The house was demolished in 1802-03.